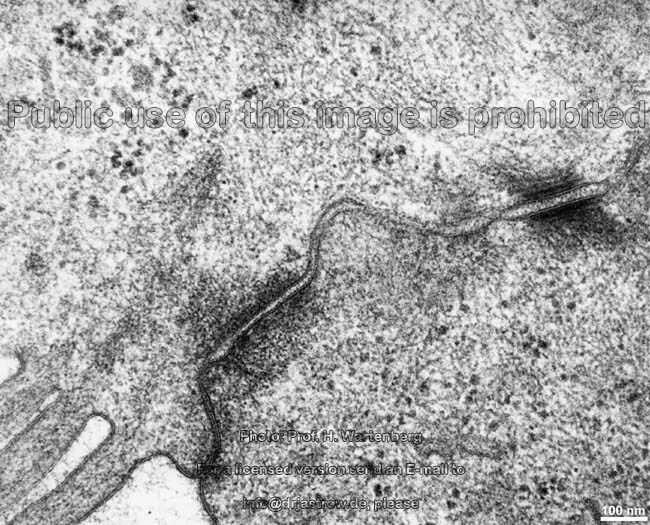 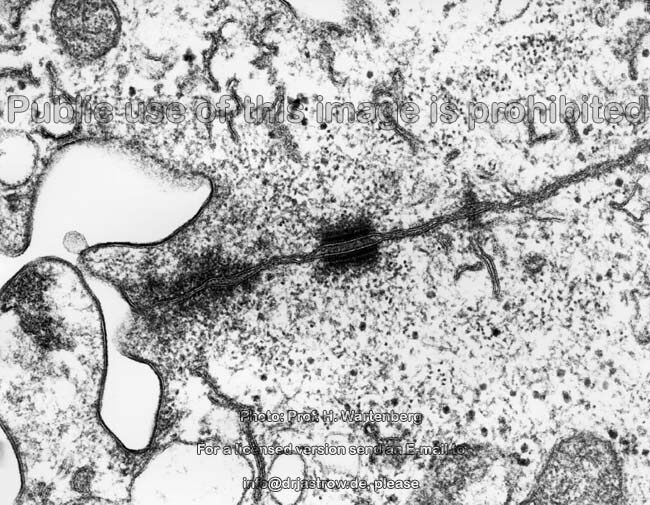 Spot desmosomes (Terminologia histologica: Maculae adhaerentes) are spot-like very stable connections between cells. 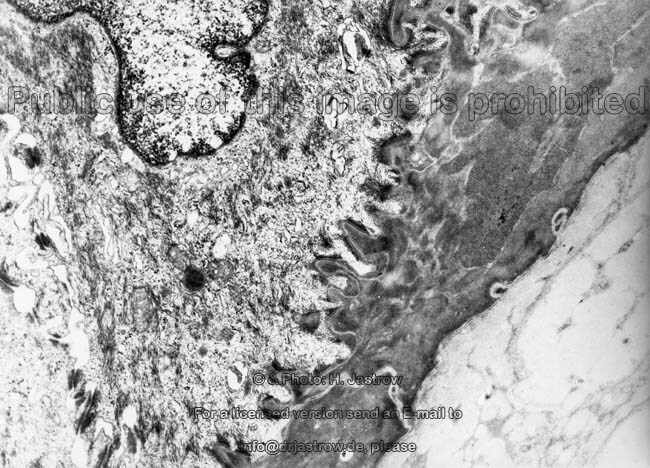 They are present between epithelial cells, heart muscle cells, arachnoidal cells and follicular dendritic cells. 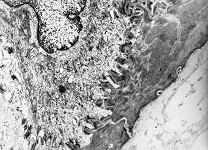 Spot desmosomes are located beneath belt desmosomes in junctional complexes and in high concentration between the spine-like process connections of the epithelial cells in stratified squamous epithelia. 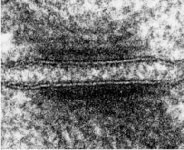 The high traction stability of spot demosomes is caused by the "glue" located in the intercellular space. 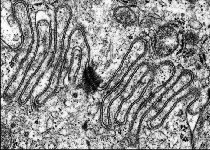 The latter is formed by transmembrane connecting proteins of the desmocollin- and desmoglein type which from their anchoring sites in the cell membrane reach into the intercellular cleft wich has a width of 15-25 nm in these desmosome areas The endings of the mentioned proteins from both cell membranes bind to each other in a way that a dense intermediate line (mesophragm) is formed. 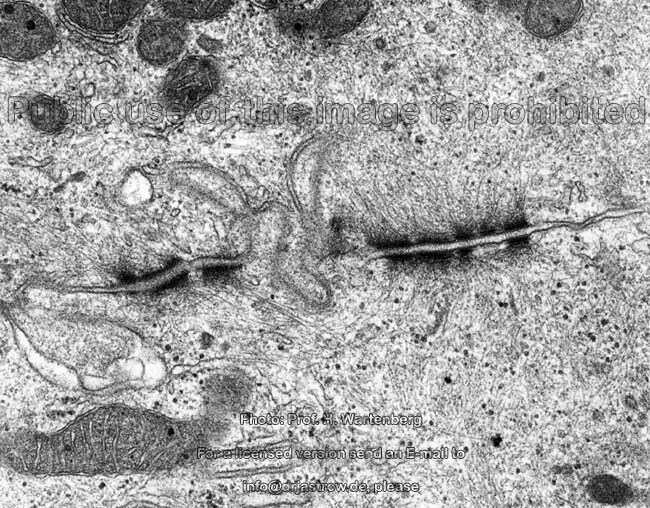 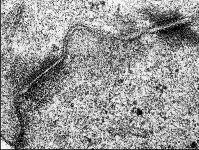 Very electron-dense plaques are attached to the inner side of the cell membrane. 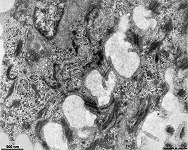 Desmocollin, placoglobin and desmoglein are the major proteins encountered in this other plaque region, i.e. 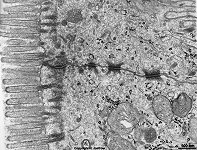 directly at the cell membrane. 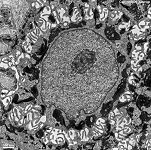 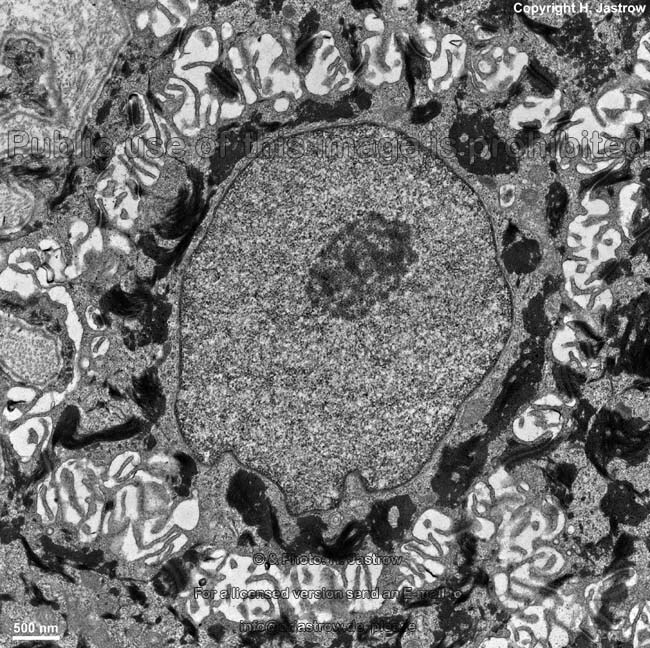 A less electron dense inner zone continues the plaque in direction to the cytoplasm. 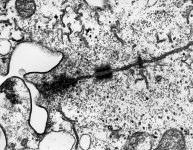 It mainly consists of desmoplacin and binds to intermediate filaments reaching into the plaque which in epithelial ells are cytokeratins. 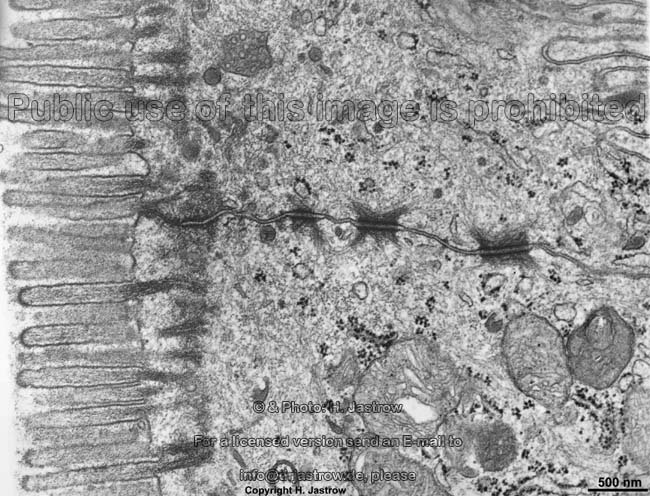 These tonofilaments belong to the cytoskeleton and reach forward into the cytoplasm and to neigbouring spot desmosomes. 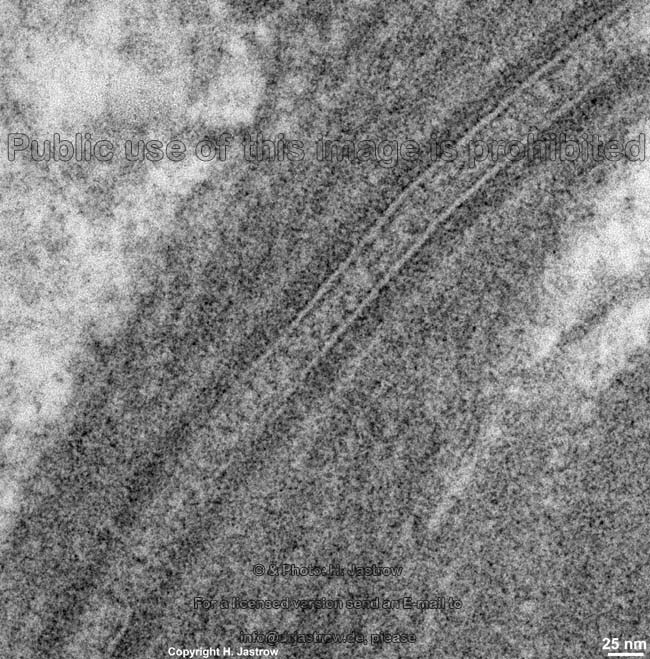 In this way loops reaching through many neighboured desmosomes are formed that are also called 10F-desmosomes since the attached intermediate filaments are 10 nm thick. 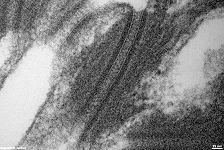 Pemphigus vulgaris is a severe skin desease caused by autoantibodies released from plasma cells against desmoglein that impair formation of stable desmosomes. 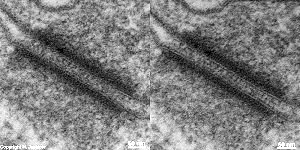 The relatively few spot desmosomes encountered between smooth muscle cells are smaller, have a reduced height and show less "glue" material. 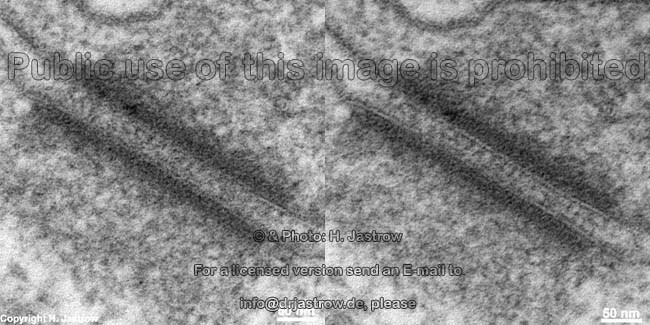 They anchor intermediate filaments of the desmin type in their plaques which have diametersof only 7 nm. 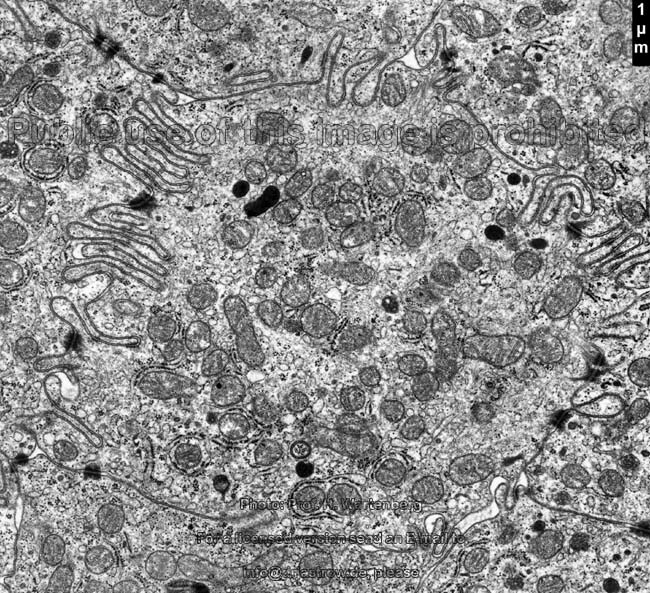 For this reason these spot desmosomes are also called 7F desmosomes. Desmin filaments are also encountered in the attachment plaques which are typical for smooth muscle cells. 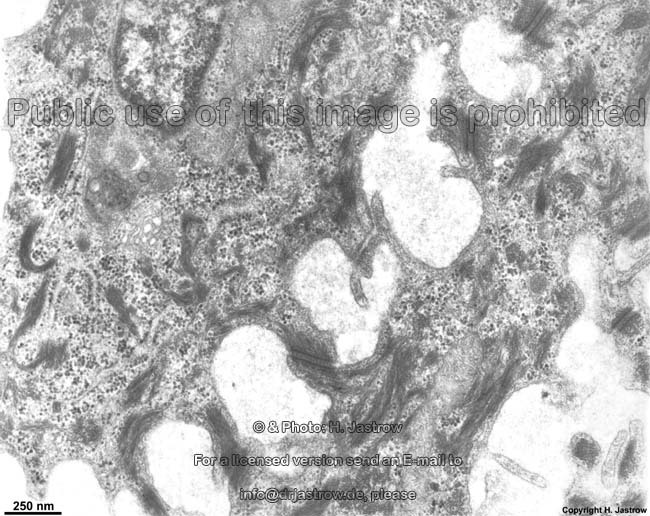 Other 7F desmosomes (with intermediate filaments of the desmin type) are present between epithelial cells of glands.